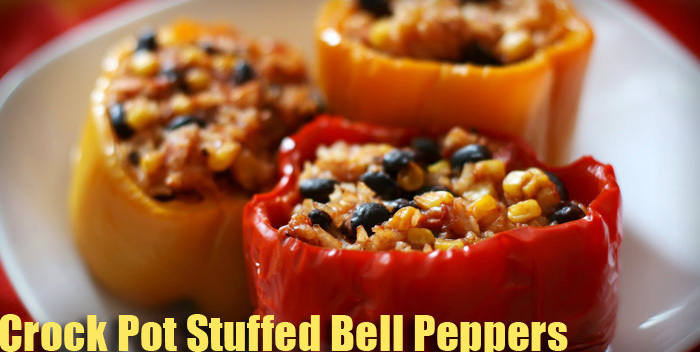 This crock pot stuffed bell peppers recipe is loaded with healthy and delicious ingredients, including black beans, ground turkey, garlic and tomatoes. And whenever you can serve a meal in its own vessel? It's a bonus. 1. Cook rice as directed on package and set aside. 2. Cut off the tops of the bell peppers. Set tops aside to use as lids later. 3. Remove all seeds and ribs from peppers. 4. Heat 2 tbsp. olive oil in a medium pan. 5. Add diced onion and garlic (minced). Sautee for approx. 10 minutes. 6. Add ground turkey to the pan, and cook until the turkey is no longer pink. 7. Transfer turkey mixture to a large mixing bowl. 9. Mix gently, and fold in parsley. 12. Place half of the tomato paste mixture in the bottom of the crock pot. 13. Stuff peppers with turkey mixture and place upright in the crock pot. 14. Spoon the remaining tomato paste on top of each open pepper. 15. Place pepper lids onto each pepper. 16. Cook on low for 6 hours.